This TypeScript-based framework enables developing front-end applications with ease for web and mobile. With so many new Angular apps being released, we want to ensure that every developer can easily protect their code with the most resilient forms of obfuscation and protection. This tutorial will explain how to integrate Jscrambler seamlessly into Angular's build process in just a few minutes. If you're relatively new to Angular, be sure to read the official quickstart. Only two things are needed to properly integrate Jscrambler into the Angular build process: creating an Angular app and configuring Jscrambler. We will highlight both below. For the purposes of this tutorial, we will be using an Angular 7.0 boilerplate app. If you are protecting an app which is built using Angular 5 or earlier, please refer to our documentation. We also have a tutorial that’s specific to AngularJS. The Angular CLI will download and install all the required dependencies for the latest Angular version — in this case, it's version 7. During the installation process, you will be prompted to decide if you want to add Angular routing and you will also be able to choose a stylesheet format. Pick the options that best suit you and wait for the installation to finish. For the sake of this tutorial, we went with the default options. That's all we need to have a functional Angular app. Check if everything is in place by running the app in the browser. By default, it will run on http://localhost:4200/. If you need more information on getting started, please refer to the official documentation. You can also run ng help to check all available commands. angular.json contains all the CLI configuration for all the projects in the workspace. Options for build, serve and test tools that the CLI uses are defined here. package.json contains all the configurations which are related to npm such as dependencies, version and scripts. All of Jscrambler's configuration will reside inside a single file: .jscramblerrc. As such, we will need to create this file to specify which transformations we wish to use. The quickest way to achieve this is via the Jscrambler Web App. Once there, create a new app. 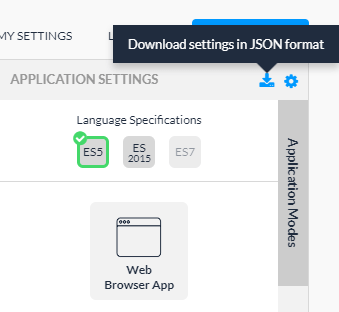 Now, in the Application Modes tab, select the Language Specifications and application type. Next, select the transformations you want (check the Templates and Fine-Tuning tabs). In this tutorial, we'll be selecting the Obfuscation template. If you need help with these steps, please refer to our guide. Now, we simply have to download a JSON file with all this configuration, which will be used only for quickly getting the required settings. Because we got this information directly via the Jscrambler Web App, our accessKey, secretKey and applicationId fields are already filled. If you wish to retrieve them manually, refer to our guide. It's important to note that the params section specifies the transformations that will be used to protect your Angular app. These can be hand-picked by you, by selecting them in the Web App or setting them manually. You can find documentation on all the available transformations here. You can also change filesSrc to match the files you need/want to protect. For our example — and all Angular apps — we recommend protecting all the .html and .js files. Certainly, with a better understanding of the project, you may identify what’s critical and essential protecting. By using filesDest: './', the files we send to protect will be overwritten by their protected version. There are two major ways to integrate Jscrambler into the Angular build process: Angular CLI and Webpack. We will cover both below. Using Angular CLI is likely the most common way of generating your build. We will use our boilerplate app to showcase how to integrate Jscrambler into the build process. The specific "build:prod": "ng build --prod && jscrambler" hook will trigger the jscrambler command after the build process is finished. In order for this command to be executable, we need to place the .jscramblerrc file that we created before in our project's root folder. This will create the production files on dist/<app-name>. With the ng eject command being deprecated on Angular 6 and above, to use a Webpack build process you must extend the underlying build configurations with an angular-builder. In this tutorial, we will use the custom-webpack builder but feel free to use any other approach as long as you feel it suits your use case better. After doing so, we shall now create our Webpack config file that will be then merged to the built-in configuration. You might want to have at least 2 different configurations, for development and production builds. Note that we are only protecting the main chunk which is where all the application logic is contained. To start using those new webpack configurations, we shall update the build options on the angular.json file. By setting the vendorChunk flag to true, all the vendor content will be generated into a separate bundle file. This is optional. With those steps, production builds npm run build:prod will use the Jscrambler Webpack client to protect your code and use the previously defined .jscramblerrc. Then, you need to set your Angular app's files to run inside this local server. Now, as you should be able to see on the terminal, you can run this server on two ports. One which is publicly available, and another which is specific to your machine. Open the provided URL and your app will start in the browser. Angular is a popular and growing framework that empowers developers to create solid web and mobile applications by leveraging the conventions of data binding, services, and dependency injection. If you're building apps which need to be protected against code theft, reverse-engineering, piracy, licensing violations or even malware injections, Jscrambler is a vital addition. As we've shown, integrating Jscrambler into Angular's build process is straightforward. If you're in need of some further assistance, feel free to contact us! In this post, we're going to go through the steps required to protect your AngularJs application, including setup, build process and compatibility with Jscrambler. Learn how you can handle forms in Angular 7 web apps by leveraging Reactive Forms and post the reactive form to a REST API endpoint.